This should wrap up the dating of the After The Dragon War posts. Next up I’ll be plotting out what I want from the Dwarven Schism. 877BCE: Tentineh himself was responsible for constructing the defenses of five Dragon Orbs. He designed a floating superstructure to house the Orbs, but this massive construct would require more magical ability than Tentineh nor any of the other Heroes possessed. Tentineh began searching in the dark places of the world for the energy required to bring his vision to life. Bigby retired to the woods of his childhood. He married and had children. 876BCE: Tentineh found a font of energy that he could use for his superstructure. He freed the Dahak from its ancient prison beneath the Greshen Volcano. In gratitude the Dahak promised to aid Tentineh in his endeavors. The two worked in concert to create a floating city. A gigantic edifice spanning for miles built on the upturned bottom of the Dahak’s volcano and four other lava-filled mountains. 875BCE: An enormous amount of power was required to keep Tentineh’s superstructure afloat. Tentineh began manufacturing over a dozen artifacts with untold powers. Upon completion he connected them to the volcano quintet. Additionally, the Dahak bound omnielementals to the volcanoes. A minor version of the elemental planes swirled and formed between the lava tubes. 863BCE: Tentineh placed the artifacts he’d created within his superstructure. He used the five Dragon Orbs entrusted to him to power the structure as well. Red, Green, Black, White, and Silver would power the city, one within each of the volcanoes. 862BCE: Still more power was needed for the superstructure so Tentineh ripped the raw life from the Greshen Valley and poured it into the floating city. This greedy act created Spheres of Annihilation throughout the Valley. These black holes roamed the land, erasing everything they touched. 861BCE: Tentineh’s superstructure was completed. He bequeathed the construction to the people of Greshen Valley. It would be a new home for them. A floating city that would protect, feed, and shelter Tentineh’s people for all time. In time this city would be known as Greshendale. The grand wizard gave the leadership of this city to a council composed of his children and his apprentices. Tentineh would not rule the city. He prepared to enter eternal slumber. This post needs a little bit of clarification. As much as possible I try to avoid two characters having the same name in my campaign world. It happens often enough in real life and in real history, but it easily confuses people (Just try and explain the Norman Conquest of England to someone). Unfortunately, I couldn’t avoid having two people with the same name in this case because one of my players wanted to name their character after an imagined hero of the past. I’m getting around to filling the gaps and now that hero of the past has his own story below. This post details Amalgami the Hero of Old, not Amalgami the Betrayer. Amalgami the Hero was known as the Lightning Knight. He joined the other heroes of the Dragon War in casting down their draconic oppressors. He was a son of Zeus and his father gifted him with power over lightning and storms. Amalgami made friendships easily and if it weren’t for him the heroes of the Dragon War may never have worked together to accomplish their great deeds. At the conclusion of the war he slumbered along with the other heroes to return when the world needed him again. Zeus found himself attracted to Brina, a priestess of his wife, Hera. Zeus will be Zeus, so he had his way with Brina and then left her to the anger of his wife. Infuriated that one of her own clergy would betray her (regardless of Brina’s own wishes in the encounter), Hera decreed a similar punishment that was given to Leto, the mother of Apollo and Artemis. Brina would never deliver her child on dry land. I’m taking a swing at finishing more of the Cimmerian Timeline, but this entry is not chronologically synced with the others. Instead, this post will be about what I’ve written for the first five heroes of the Dragon War. Where do their exploits stand in time prior to the events leading directly to the Dragon War? What year did Tracy steal all those weapons? How long did Jovy and Cecilia travel for? Now’s as good a time as any to input that information into the Timeline. Some of those events are still dependent on other factors though before I decide the specific year in the Timeline. Because of that, I’m only putting in Tentineh, Jovy, and Cecilia’s backgrounds. 954BCE: Hymniara was born along the western Caspian coast. 945BCE: Tentineh was born to a merchant couple in Greshen Valley. His mother had been stung by a wyvern in her youth. The wyvern’s poison still festered in her body and it transferred into Tentineh, giving him great physical and magical strength. 941BCE: Hymniara began running with the followers of Artemis and considered joining their band permanently. 939BCE: Hymniara’s dreams were cut short when she encountered Zeus in the form of a trout. The pair enjoyed carnal relations. Hymniara declared the loss of her innocence to Artemis. She left the band on good terms with a gift of fish scale armor. 938BCE: Hymniara gave birth to Cecilia. Tentineh began his apprenticeship to a wizard and descendant of Sadroston. 937BCE: While still a babe, jealous Hera sent scorpions to poison and kill Cecilia. Instead of dying, Cecilia slew the scorpions and ate them! 933BCE: Jovy was born to a farmer couple in Zeus’s Canvas. 930BCE: Tentineh completed his apprenticeship two years early, already having surpassed his master. He started traveling to learn more about the four elements and how to channel their energy. 926BCE: Cecilia grew into beauty and womanhood. Men approached her and her mother asking for her hand in marriage. Cecilia challenged them to contests of skill and might. If she lost she would marry them. If she won, the men owed her their shield and armor. Many men lost their panoplies and Cecilia stayed a maid. 921BCE: Cecilia left home to travel the world and do great deeds in honor of her patron gods, Artemis and Zeus. 920BCE: Tentineh completed his travels. He built himself a tower in Greshendale and studied summoning magic within his warded home. Cecilia settled with the Elves of Bigby’s Forest for a time and learned much from then. She mastered wrestling, swordplay, and the basics of magic. While staying with the Elves Cecilia defeated many wolves, bears, basilisks, and orcs. 915BCE: Jovy had grown to be an unruly teenager. He avoided his responsibilities as often as he could, electing to swim, play, and steal rather than complete his farmyard chores. Jovy’s father arranged an early marriage in the hopes that it would force his son to settle down. Jovy took off in the night and never returned home. He journeyed westward, stealing valuables and girls’ hearts along the way. 914BCE: Cecilia learned everything she could and her time with the Elves came to an end. She traveled to the Caspian Sea and followed the coast eastward. Jovy’s journey took him southward along the Caspian shore. 913BCE: Jovy reached the Aractrash River where Hermes spoke to him. The Olympian told Jovy to build a giant bowl and push it into the River. Jovy built the wooden bowl, but he lacked the strength to push it into the river. At this time Cecilia arrived on her journey. She easily pushed the bowl into the river. As she did so the bowl turned into a double-masted ship with a crew of phantom sailors. Jovy and Cecilia sailed the ship, named Mira Miro, into the Caspian Sea where they slew many sea monsters. 910BCE: Satisfied with all he discovered about of summoning magic, Tentineh finally decided to get married. A ceremony wedded him to his long-time maid and assistant, Fafarella. Fafarella was soon pregnant and the line of Tentineh continued. 908BCE: A troll army attacked Greshendale. Tentineh was unable to defeat the army solely with his command over elemental fire. Forced into a corner, the great wizard summoned a beast from the fiery pit, a great fire slaad. The monster slew the trolls and rested afterwards to regain its strength. Fearful that the people of Greshendale might be the next to feel the slaad’s evil heat, Tentineh poured over old scripts and tomes for a method to seal the slaad away. Jovy and Cecilia defeated the majority of the sea monsters in the Caspian, freeing the sea for the people of Cimmeria to sail and fish upon. Cecilia returned to her home and protected the growing coastal town from the prevalent monster threats of the time. Jovy stayed upon the Caspian Sea to survey Those Blasted Islands in the sea. 907BCE: Tentineh’s search proved successful. He found a ritual to bind the slaad into an eternal prison. The beast was contained. not wanting to resort to such magic again, Tentineh began training the people of Greshendale to fight and cast magic despite the rule of the dragons that forbade such practices. 906BCE: Jovy completed his survey of Those Blasted Islands. He began transporting people from the Caspian coast to the islands to colonize them. Jovy proclaimed himself King of the Caspian and he began taxing/extorting valuables and commodities from his citizens. 901BCE: A horde of giants attacked Greshendale. Left with no other choice, Tentineh revealed his army in open violation of the dragons’ laws. The giants were defeated, but greater dangers might come as a result. Jovy took some time off as King of the Caspian to visit the Dwarves in Jord. He fit in like fingers in a glove and became a minor celebrity to the Hill Dwarves. 900BCE: Tentineh called the heroes of the land together and the Dragon War began. Greshen Dale is the most magical city in all the land. The original city was underground to avoid the extreme temperatures that are the norm in the far north. However, a swarm of Bulettes came through the area destroying much and making too many unwanted tunnels. These extra tunnels collapsed most of the old city making it unlivable. A change had to be made, so the council of mages decided to create a flying fortress impregnable against any assault to house the population of Greshen Dale. The plan for the new floating city was made by the powerful mage, Tentineh. He devised a method for harnessing the lava of a volcano to power the city. The annually active Dahak Volcano the previously loomed over the northern end of Greshen Valley was chosen to power the city. In addition to the lava power, Tentineh ripped magic from various endowed places and put it into the items that keep Greshen Dale afloat. This reaping of the land has created a few Spheres of Annihilation in Greshen Valley, but the citizens don’t really care. They are literally above that. The Dahak Volcano was ripped from its natural place in the Terror Mountains and turned upside down to make a flat place to build upon. As all volcanoes in the Magical Lands are prisons for great and terrible monsters this act didn’t come without its consequences. The monster released from the volcano was the Dahak. He wants Zeus to have a son with Metis. Dahak’s repeated attempts to free Metis earned him the treatment reserved for the most terrible of monsters. Dahak did not kill his savior, Tentineh, in the typical evil monster way, but thanked him and summoned a group of Omnielementals to help with the construction of the floating Greshen Dale. It is rumored that Dahak now lives in the mountains slaying monsters and practicing his skills until he can challenge Zeus and free Metis. A separate group of wizards in the old underground-based Greshen Dale attempted to rebuild the city above ground, but further south. The settlement flourished for a time, but the frequency of troll attacks in that area eventually led to the abandonment of what was dubbed New Greshen Dale. The flying city constructed by Tentineh now looks like a three mile wide half-sphere of rock with four smaller half-spheres overlapping around it. Large holes in the center of each of these balls emit tremendous blue light that illuminates the entire valley underneath the city. The top of the city has many pure white stone buildings with large, marble paved streets in between them. The avenues have grass and fruit trees growing in the middle of them. The buildings have a blue trim and are built in an Arabic style. Most food is magically created, but rather bland. Everyone has a garden to make the gruel from create food and water spells taste better. Some people use their gardens exclusively to make olive oil and wine which they sell to the rest of the city. There is a labyrinth inside the volcano of the city where lava flows to power all the street lights, eradicate all the waste, power the magic that produces all the food and water, and project the forcefield around the city that prevents flying and teleporting intrusions. The artifacts, elementals, and other things that power the fortress are all guarded by golems other elemenetals. The five artifacts that power the blue lights keeping the city afloat are surrounded by a wall of force and are guarded by dragons. Greshen Dale has a very static population of 20,000. The city has no more room to expand to include more population. Births and immigration have to be carefully controlled. This task is given to the Sky Patrol. The Sky Patrol prevents anyone from flying into the city and anyone who teleports into the city is redirected to the entry pad on the south side. People who can teleport in on their own or have been to the city legally before are allowed to stay with a tourist pass. There is another way into the city without teleportation. Those who have legally been to the city before can use the teleport pad directly below Greshen Dale to ascend to the entry pad without expending a spell. Everyone can leave the city in the same manner. This leaves out those who weren’t born in the city and those who can’t teleport on their own. Such people must traverse the caverns that were once the original city of Greshen Dale. The caverns contain many traps and minor constructs to challenge people. Within these winding passage ways are magical items that act as tourist passes and allow access to the city. All the necessities in Greshen Dale are free. You need not pay for food, water, clothes, or a house. They are all provided by the magic of the city. Luxuries, magic items, and the right to see tourist attractions must still be paid for. Luxuries and attractions are at fairly steep prices as well for this is the only way to make a living in the city without using magic. Magic items are cheaper and the selection wider because Greshen Dale is where most of them are made and exported to other cities. Greshen Dale is home to many schools of magic including the prestigious War Mage Academy. Entrants are mostly from the city itself, but some foreigners pay large amounts of money to the city to get in without going through the trials or knowing how to teleport. Education must be paid for just like other expensive goods and services. 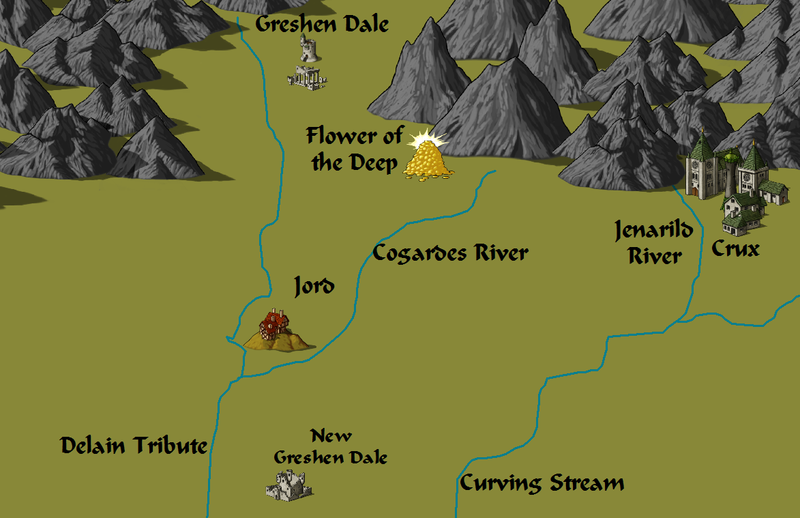 Greshen Dale is ruled by a council of mages. A councilor is allowed from each university and from each guild present in the city. They meet every two months to discuss the business of the city. Until recently the presiding councilor was traditionally not a mage, but a psion with the title, Cerebremancer. The last Cerebremancer was a dromite named Talon. The head of the War Mage Academy, a grey elf named Krodius, leads the Sky Patrol which enforces the decrees of the council. The center of the city has a large plaza where many things are sold and magic tricks are preformed. In the exact center of the plaza is a large well that goes all the way through the volcano. The hole has rails preventing people from falling in. At the center of this hole is the Staff of Oblivion, an artifact known for its power against undead. Twelve bolts of lightning continually emanate and crackle from the staff and go to the sides of the hole. No one is sure why Tentineh placed it there, but most assume for defense or to have a piece of what keeps the fortress afloat visible to the public. The well is used to make offerings to the Dahak who is still a patron deity of the city. During the First and Second Alliance Wars Greshen Dale has so far remained neutral. The Xorians offered citizenship to the people of Greshen Dale after the Battle of Phoenix in the Second Alliance War, but the council of mages declined in favor of continuing their neutrality. This declination also involved the signing of an official neutrality document. This document allowed free access to the city for Xoria’s Dragovinian population. The Dragovinians moved in, led by Lady Li of Colchis, and began converting the people of Greshen Dale to Dragovinysm. Cerebramancer Talon, seeing that his people would inevitably decide to join the Xorians, attempted to stop them from joining with an evil power. Talon allied with Amalius, Torin, Tagenadi, and Eathirilu to secure the Red Orb of Dragonkind from the northwestern sphere of Greshen Dale. The sphere could float for a time on its own without the Orb. The Orb could then be used to dominate Lady Li and her followers and expel them from the city. Unfortunately, Amalius deviated from the plan by willfully destroying the Red Orb in order to free the captive red dragons, Invernix and Sartoria. Talon’s involvement was quickly discovered. He fled into the lava tubes beneath the city with a few loyal followers. In his absence, Lady Li and the new Dragovinian Sky Patrol Leader, Krodius, rule the city. Talon and his followers fight a guerrilla war against the Dragovinians in the city, but it is only a matter of time before the city officially joins with the Xorian Empire.